Layouts provide an interface for composition of print jobs. A layout shows a sheet of paper based on the default size and orientation of a paper sheet for the default printer. 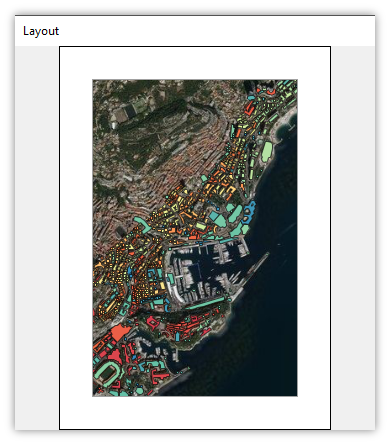 We add components such as maps, drawings and images to layouts by dragging and dropping them into the layout. An item added to a layout is called a frame. When first added, a new frame fills the entire layout. We Alt-click within a frame to choose it for editing, which allows us to resize the frame and to move it about. When we are happy with the size and position of the frame we click outside of the frame to finish editing it. Right-click in the Project pane and choose Create - New Layout to create a layout. Open the layout. The layout appears sized to the default sheet of paper for the default printer. Choose File - Page Setup to specify a different paper size, orientation and margins for the layout. 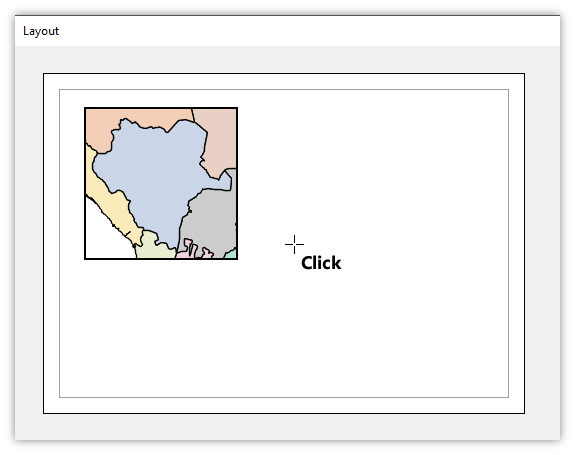 Drag and drop a component into the layout. It appears as a frame that fills the layout. 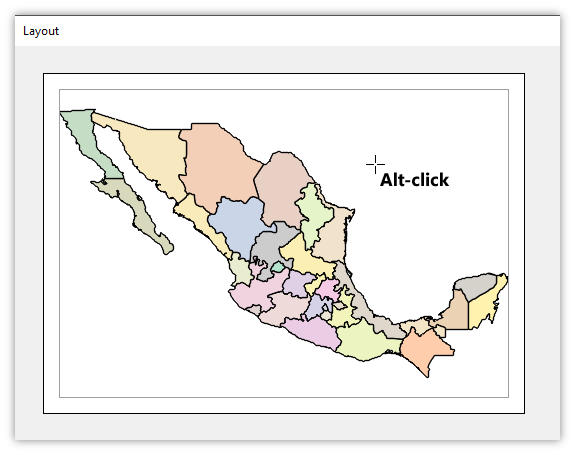 Alt-click on the frame to choose it for editing. Edit handles will appear. Resize the frame and move it as desired. Click anywhere outside the frame when done. Double-click within a frame to enable that frame for panning and zooming within the frame. Adjust the viewport as desired and then Click outside the frame when done. Use the Layers panel in the Contents pane to delete a frame, to reorder frames, to turn frames off and on and to set the transparency of frames. Choose File - Print to print the layout. 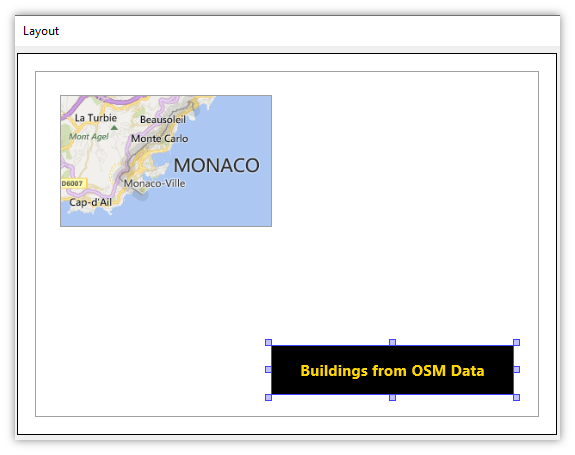 Drag and drop a component from the Project pane into the layout to add it to the layout as a frame. Put the Alt-clicked frame into edit mode where it can be resized and moved. Drag a border or edit handle to resize. Click within the frame and drag to move the frame to a different position. Put the double-clicked frame into exclusive pan/zoom mode. All panning and zooming commands will apply only within that frame. This allows us to pan and zoom the view provided by the frame into that frame's component. If a double-clicked frame is partly off-screen or if it is too small for reasonable panning/zooming, the frame will be autozoomed to be larger, filling the layout window. Click outside a frame to end edit mode established by an Alt-click or to end pan/zoom mode established by a double-click. Press the Escape key to exit alt-clicked mode for editing a frame or ctrl-clicked mode for panning/zooming a frame. Set paper size, orientation of Portrait or Landscape, and margins. By default, margins are 25.4 mm (1 inch). Changing the paper size, orientation or margins with an existing layout that already has some frames will automatically adjust the placement and size of existing frames. Changes made in page setup will be saved into the layout. Launch the usual Windows dialog to print the layout. 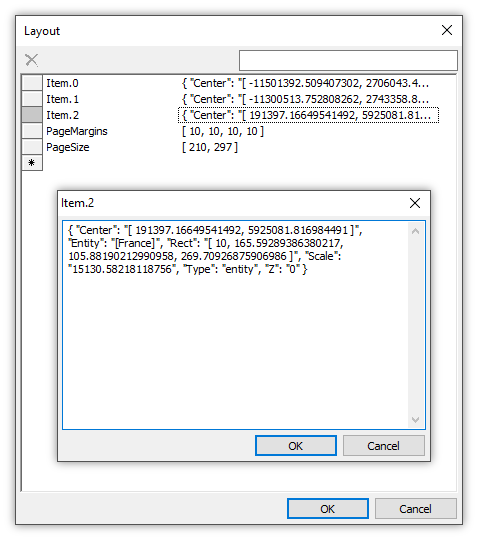 Any changes made during use of the File - Print dialog and subsequent dialogs to paper size, orientation or other attributes will temporarily try to adjust the placement and size of existing frames for that immediate print job, but will not be saved into the layout. Use File - Page Setup to make persistent changes to the layout. The usual Selection keyboard commands work, as well as Edit - Select All, Edit - Select None, and Edit - Inverse, from the main menu. A selected frame's border will change to red selection color. The same mouse selection commands work in layouts as they do in drawings. Adding the Ctrl key to a mouse click or click and drag makes selections. Adding the Shift key to those Ctrl mouse motions means to deselect. Select or de-select the frame. Ctrl-clicking a selected frame will de-select it. 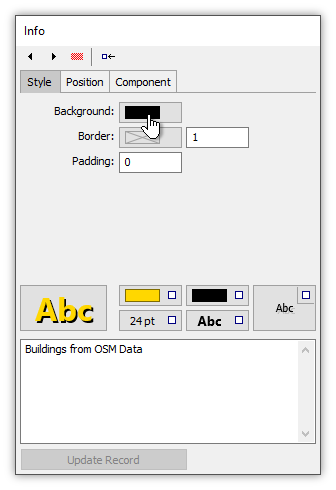 Draw a selection box to select all frames any part of which is within the box. 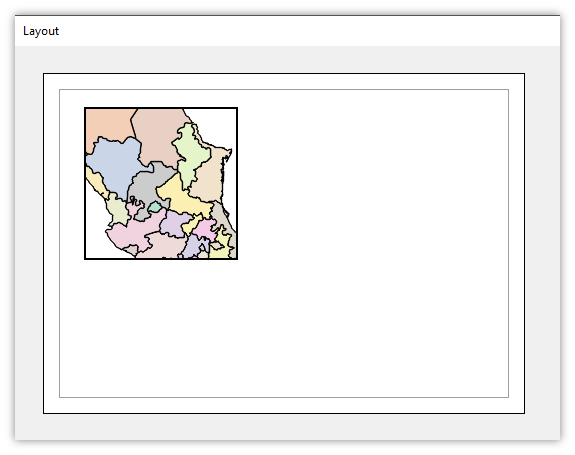 Draw a selection box to select all frames entirely within the box. De-select the frame. No effect if the frame is not selected. 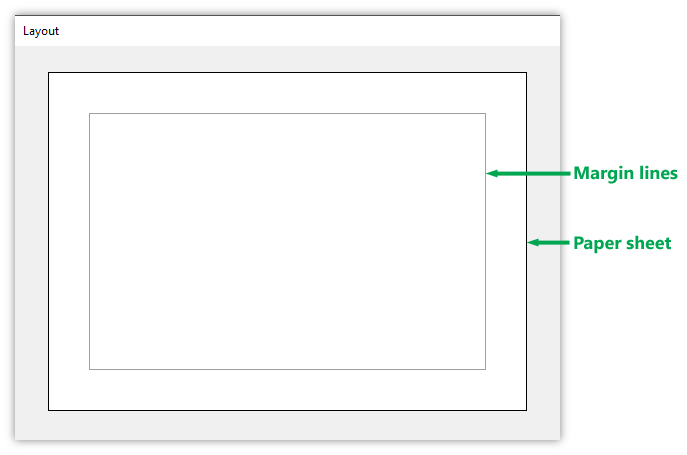 Draw a selection box to de-select all frames any part of which is within the box. 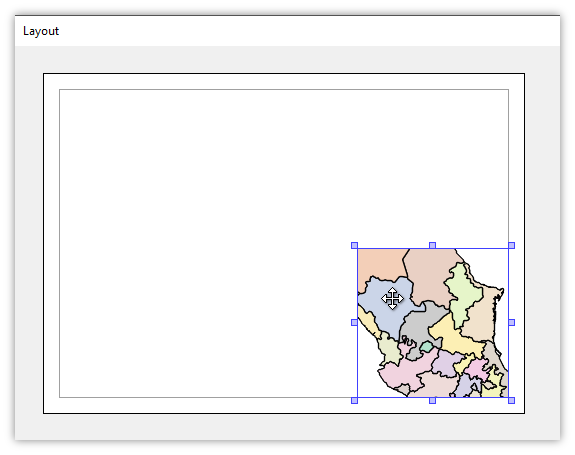 Draw a selection box to de-select all frames entirely within the box. See the main Selections topic as well as the Example: Mouse Selection in a Drawing Window topic for illustrations using objects in drawings. The same motions apply to frames in layouts. Choose File - Create- New Layout or Right-click into an empty portion of the Project pane and choose New Layout. Provide a Name for the layout as desired and then click Create Layout. 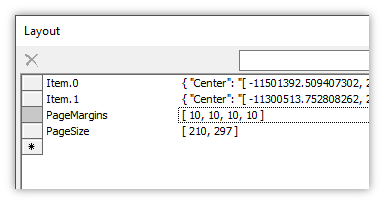 Optionally, to launch an SQL query that creates a layout in the Command window, press the Edit Query button. A new layout component appears in the project. Double-click on the layout to open it. Illustrations that follow show the layout window after it has been undocked. We can zoom in or out and pan the layout window as desired, using the usual commands that apply to windows. A new layout starts out blank. A layout appears as if it were a sheet of paper sized to the default size of paper and default portrait or landscape orientation for the default printer, with a dark line border marking the edge of the paper. 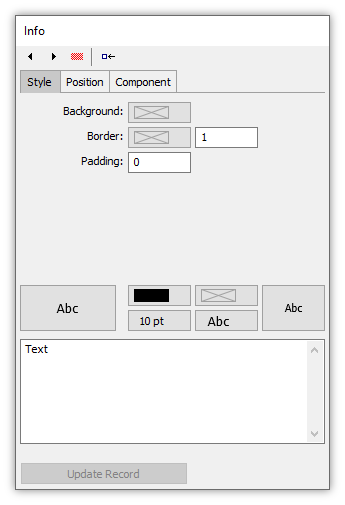 A very fine, light gray inner border indicates the default margin, similar in size to the default margin in Word. The illustration above uses Letter size paper in portrait orientation. Letter size paper in the US is similar to A4 international size paper. If we would like to change the page size or margins, we can do so using the File - Page Setup dialog. For example, to change the page size to A4 international size, open the layout and then choose File - Page Setup. In the dialog choose A4 paper size, an orientation and the desired margins. The default margins, 25.4 mm, are 1 inch margins. In the above illustration we change the default 25.4 mm margins to 10 mm margins. We press OK to apply the changes. For this example we will use A4 paper size and 10 mm margins. Changing the paper size, orientation or margins with an existing layout that already has some frames will automatically adjust the placement and size of existing frames. To add content to a layout, drag and drop a component such as a drawing, image, map, labels component, etc., from the Project pane into the layout window. 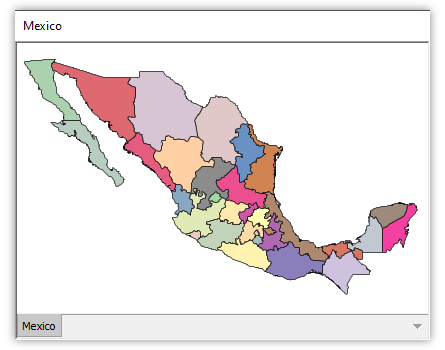 We drag and drop the Mexico example drawing from the Project pane into the layout. 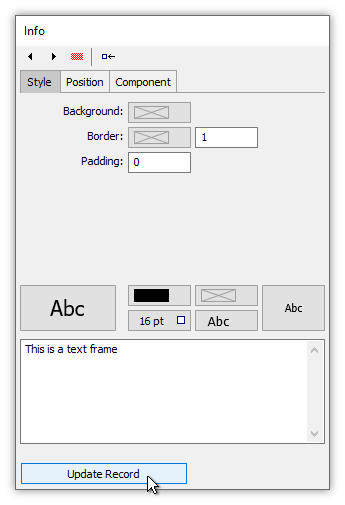 Elements within layouts are called frames. 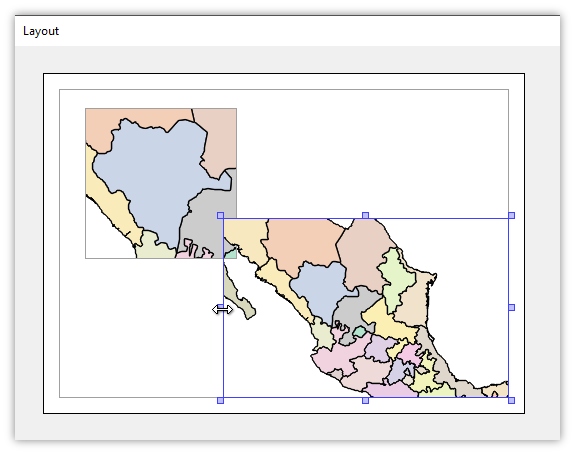 Dragging and dropping the Mexico drawing into the layout adds the first frame to the layout. A newly-added frame fills the layout, with the contents of the frame zoomed to fit the margins of the layout. 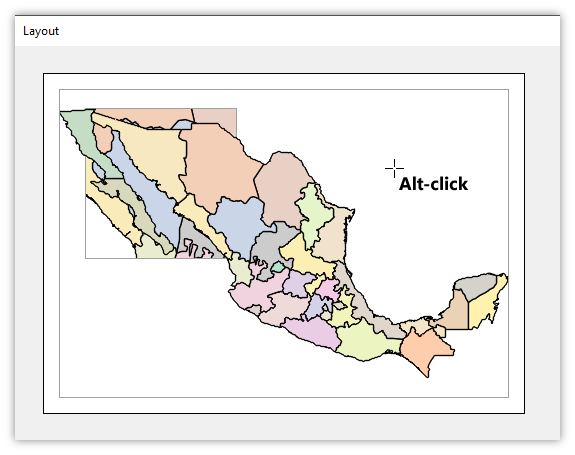 To resize or to move the frame, we Alt-click anywhere within the frame. Since a newly-added frame fills the layout we can click anywhere within the margins of the layout. Alt-clicking within a frame chooses that frame for editing. A darker border line appears around the frame with editing handles at the corners. To end editing mode we can click anywhere outside of the frame. Alt-clicking a frame allows us to resize the frame by dragging the borders or by dragging the editing handles. We can also move the frame by clicking within the frame and dragging to move the frame to a new position. We cannot resize a frame or move it beyond the fine lines designating the margin. We will resize the frame to a smaller size by dragging the upper left editing handle. With the frame resized as desired we click within the frame and drag to move it. We will drag the frame upwards to a new position. Snapping: Bringing the borders of an alt-clicked frame near a margin or near the border of another frame will tend to snap to the margin or other border. This is a very subtle effect that occurs only when the frame borders being moved are very close to the margins or other borders. 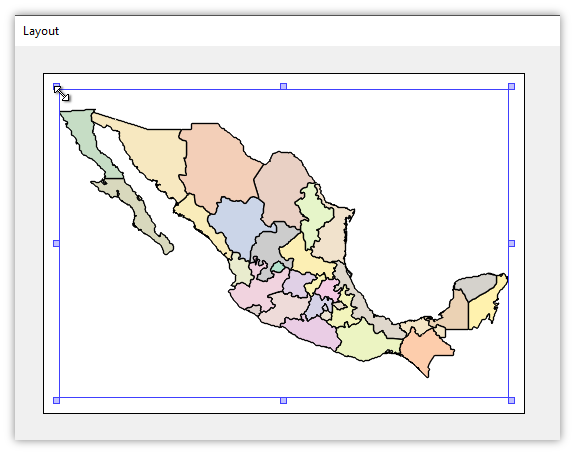 We are happy with the new position of the frame but now we would like to change the viewport, to pan and zoom what the frame shows of the Mexico drawing. To do that, we double-click within the frame. When a frame has been Alt-clicked into editing mode, we can end that either by clicking outside the frame, or by double-clicking on the frame to put it into pan/zoom mode. Double-clicking within a frame moves the focus of pan and zoom commands into that frame and draws a thick border around the frame to indicate it now has the focus of pan and zoom commands. For example, instead of the mouse wheel zooming the entire layout window in or out, moving the mouse wheel will zoom only the contents of the double-clicked frame. Autozoom: When the size of the frame on our monitors is small, Manifold will automatically zoom into the frame in the layout so that when the layout has the focus for pan and zoom we can do sensible work with it. To go back to the previous view after panning and zooming within the frame, we can click outside the frame and then click the Back button on the main toolbar. When a frame has been double-clicked into pan/zoom mode we can pan and zoom within the frame, as has been done above, to provide a closer view of the province of Durango within Mexico. All of the usual panning and zooming commands that would work for a map window will work within a frame that has been put into pan/zoom mode with a double-click. For example, we can right-click and drag to draw a zoom box within the frame. Press Esc or Click anywhere outside of the frame to end the exclusive focus of pan and zoom commands within the frame. If we want to edit the frame's size and position, we can also exit pan/zoom mode by Alt-clicking the frame to put it into edit mode. We have now added our first frame to the layout. It appears with a faint border to show the extents of the frame. Like the margin lines, the faint border appears only in the layout as a guide and will not appear when the layout is printed. We have resized the frame and moved it into the desired position on the sheet of paper, and we have panned and zoomed the viewport within the frame to show that part of the Mexico drawing we want within the frame. Next we will add another frame, also showing the same Mexico drawing. 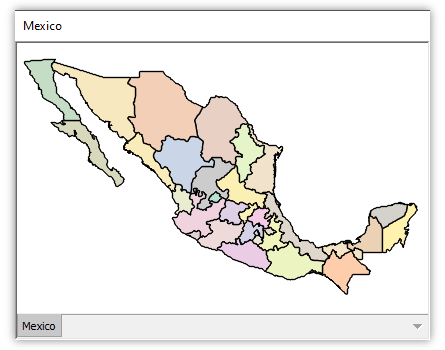 We again drag and drop the Mexico drawing into the layout. As before, it appears as a new frame that fills the layout and is zoomed to fit. The new frame appears as if it were a layer above the first frame that we added. The transparent background of the Mexico drawing allows frames below to show through where there are no objects in the Mexico drawing, just as if frames were layers in a map. We Alt-click within the new frame to choose it for editing. We drag the uppermost border down to reduce the size of the second frame. We now double-click within the frame to move the pan and zoom focus exclusively into that frame. This will allow us to adjust the view the frame shows. Shortcuts: When a frame is selected for editing with an Alt-click and we next want to move the focus into that frame for panning and zooming, we do not have to first click outside the frame to end editing mode. We can simply double-click into the frame and it will immediately switch from editing mode into panning and zooming the viewport mode. Likewise, if we have double-clicked a frame to put it into exclusive pan/zoom mode, if we want to switch to editing mode we can do that directly by Alt-clicking the frame. When we double-click the frame a thicker border appears. We can then pan and zoom within the frame to zoom out a bit, providing a bit more white space around the drawing of Mexico. We then click outside the frame to end the exclusive focus of pan and zoom commands within the frame. Our final result is a print layout that contains two frames, both of which show the same drawing but with different views. 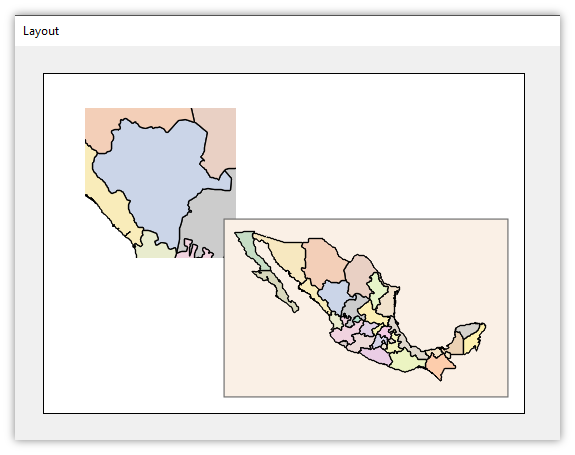 One frame shows all of Mexico while the other frame shows a zoomed in view of the province of Durango. Although this example shows two frames that both show the same drawing, we are not limited to only using the same drawing within a layout. 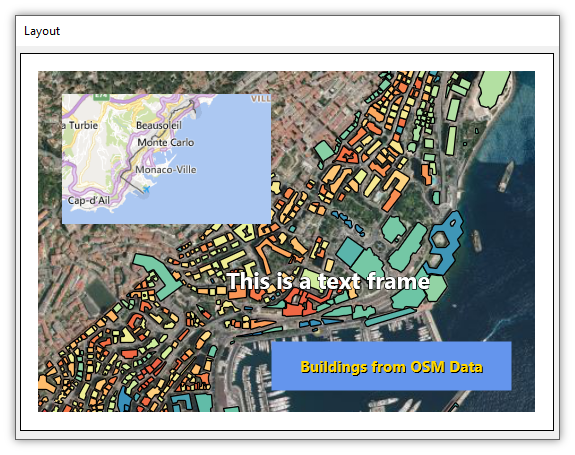 We could add more frames by dragging and dropping maps, other drawings or images into the layout. Layouts are dynamically updated to automatically show any changes made in the components which frames show. 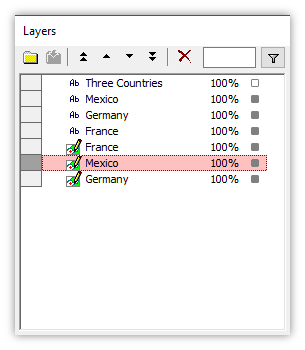 For example, if we make changes to the Mexico drawing all frames that show the Mexico drawing in any of our layouts will automatically update. Suppose we open the Mexico drawing in its own window, as seen above. 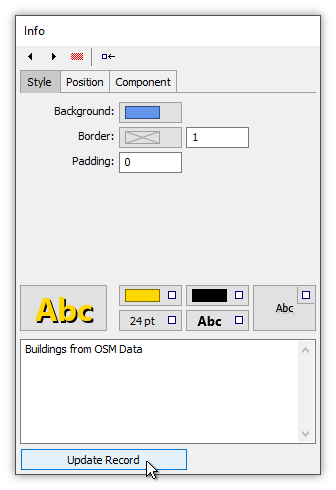 Using the Style panel we can change the formatting of the drawing. 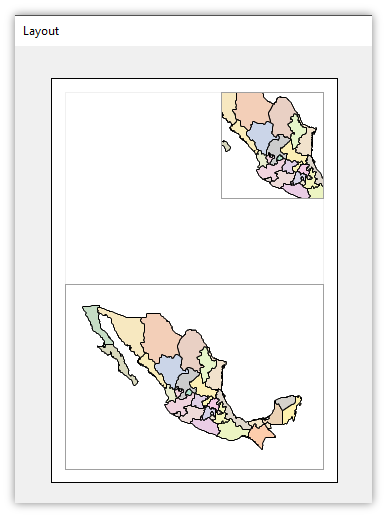 As soon as we change the formatting, frames in the layout that show the Mexico drawing also will change to show the new formatting. Beta Info: Depending on the beta build, when working with layouts we may have to dock/undock or choose View - Refresh to update the layout when the style changes in the drawing. This will be fixed soon so layouts always automatically adjust to any changes outside the layout. To print a layout, with the focus on the opened layout we choose File - Print in the main menu. The File - Print menu allows us to print either to hard copy printers or to create PDF files by using PDF printer drivers, such as Microsoft's built-in Print to PDF capabilities. See the discussion in the File - Print topic for information on printing to PDF. We use the Layers panel within the Contents pane to manage frames in layouts. The Layers pane allows us to specify the position of a frame above or below other frames, to turn frames on or off, to delete frames or to specify the opacity of frames. Consider a layout as seen above, shown in Landscape paper orientation and using eight frames. A PDF of this layout as printed by the FreePDF package may be downloaded from the three_countries_freepdf.pdf link on the Product Downloads page. The Layers pane at left below lists the eight frames in their vertical order. Five of the frames are text frames, and three are frames containing drawings. 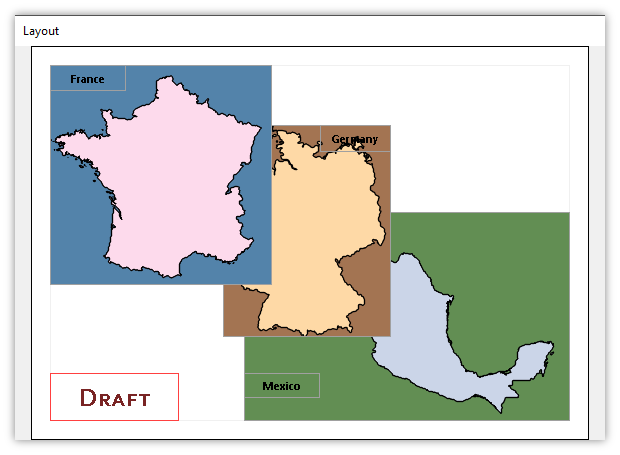 We will alter the presentation by double-clicking the Three Countries text frame listing in the Layers pane. That toggles it OFF so it is not displayed. In either the Layout or in the Layers pane, we Ctrl-click onto the Draft text frame to select it. 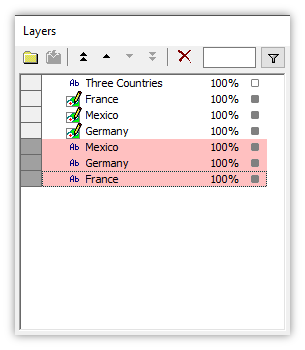 The selected row in the Layers pane appears in red selection color. The selected frame's guide border also appears in red selection color in the Layout. If we would like to delete this frame we can do so in either the Layout or the Layers pane: in the Layout we can choose Edit - Delete or press the Delete key on the keyboard. In the Layers pane we can click the Delete toolbar button or press the Delete key on the keyboard. Either way, that deletes the selected frame. It is deleted both from the Layout and from the Layers pane. 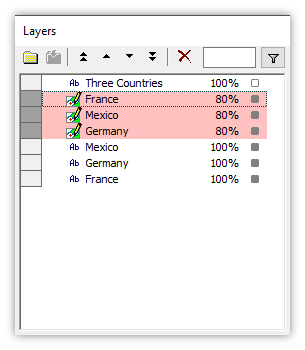 We can also use selection in the Layers pane to move frames up and down in the display stack. 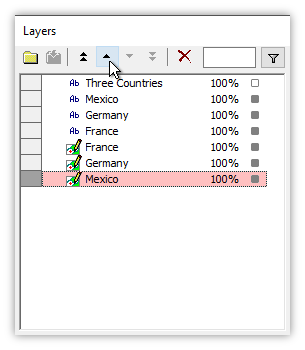 In the Layers pane illustration at left above we have Ctrl-clicked on the Mexico row to select that frame. We click the Move Up button to move the Mexico frame up one position in the stack, as seen in the illustration at right above. 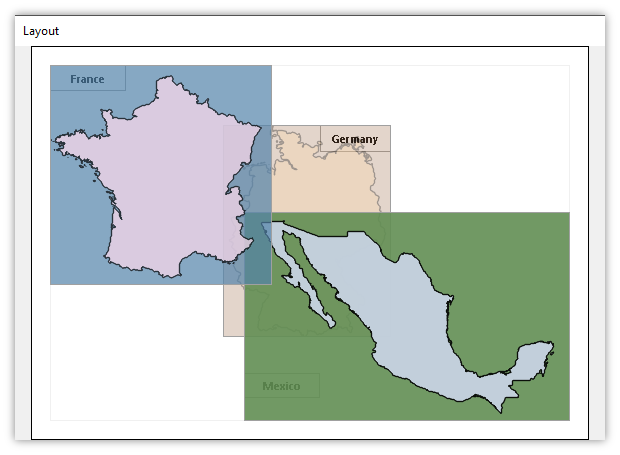 As expected, that moves the Mexico frame above the Germany frame. Move and other commands operate on all selected frames at the same time. 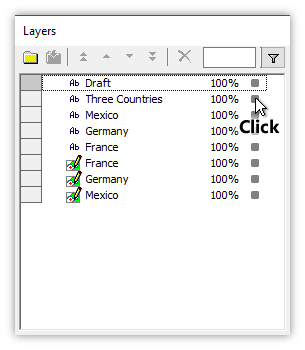 Suppose, for example, that we Ctrl-click on each of the three small text frames that contain country names. 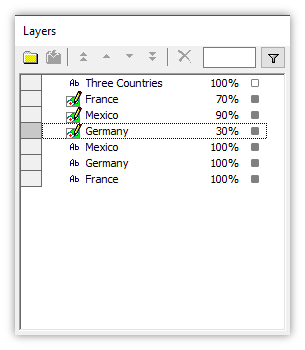 We can Ctrl-click on them to select them either in the Layout or on their rows in the Layers pane. 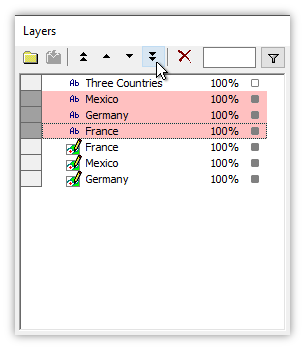 If we now click on the Move to Bottom button in the Layers pane toolbar all three selected rows will move together to the bottom of the display stack. That positions all three of the small text boxes beneath the three frames that contain country drawings. Because the three country frames are all opaque, we cannot see the small text boxes below them. To see the small text boxes through the background and objects in the country frames, we must change their opacity so they are semi-transparent. We can do that by double-clicking into the opacity cells in the Layers pane and changing them from 100% opacity to lesser opacity. 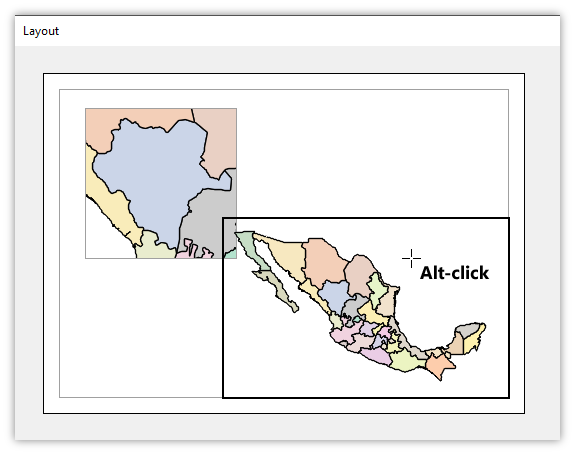 In the illustration above we have applied opacities ranging from 30% (mostly transparent) for Germany to 90% (mostly opaque) for Mexico. The now partially transparent frames allow the names of the countries below them to be visible, from faintly visible in the case of Mexico to more clearly visible with Germany. Just as in the case of controlling layer opacity in maps, a change in frame opacity in the Layers pane applies to all selected frames. 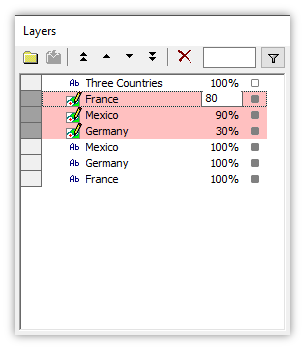 In the illustrations above, we have selected the France, Mexico and Germany frames in the Layers pane by Ctrl-clicking their rows. We double-click into the France opacity setting and change it to 80. When we press Enter to commit the edit, the opacities for the other two selected frames also change to 80% as seen in the layers pane and in the Layout illustration below. 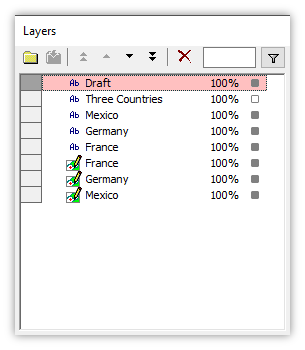 As with other lists in the Layers pane, such as for layers in maps, the usual selection moves and shortcuts such as Ctrl-A to select all, Ctrl-I to invert the selection and so on work in the Layers pane for frames as well. A PDF of the above final version of the layout as printed by the FreePDF package may be downloaded from the three_countries_end_freepdf.pdf link on the Product Downloads page. Frames are created with transparent background color. To change colors, for example, to use blue, brown or green background color as seen in the illustrations above using France, Germany and Mexico, we Alt-click a frame to pop open the Record panel for that frame. In the Style tab we can change the background color. Consider the illustration above, showing the layout at the very beginning of this topic. 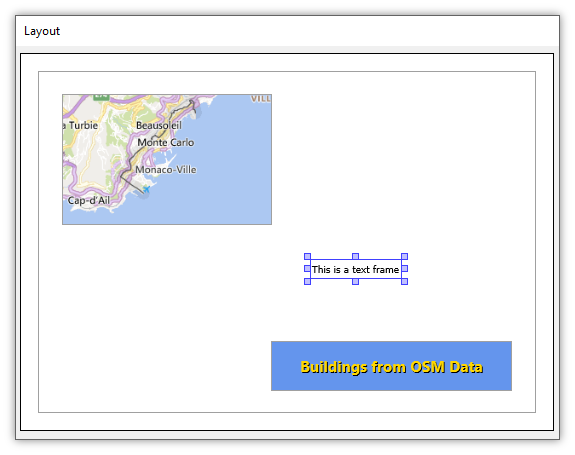 We have turned off the background map to simplify the display, and we have Alt-clicked onto the text frame containing the text Buildings from OSM Data. That launches the Record panel of the Contents pane for the frame. In the Record panel's Style tab we click on the Background color button and change the background color from black to blue. We then press Update Record to apply the change. Instantly, the background color used by the text frame changes from black to blue. Text frames are frames that contain text. They are created entirely within the layout and do not take their contents from some other component, the way other frames may show content from maps or drawings. To create a text frame, open a layout, choose the Create Label tool from the drop-down menu for the mode button in the main toolbar, and then click the approximate center of the text frame you would like to create. A small text frame appears at that location with the default word Text in the frame. The Record panel pops open to the Style tab so we can edit the text and change colors font, style and size as desired. When we would like to apply any changes, we press the Update Record button. 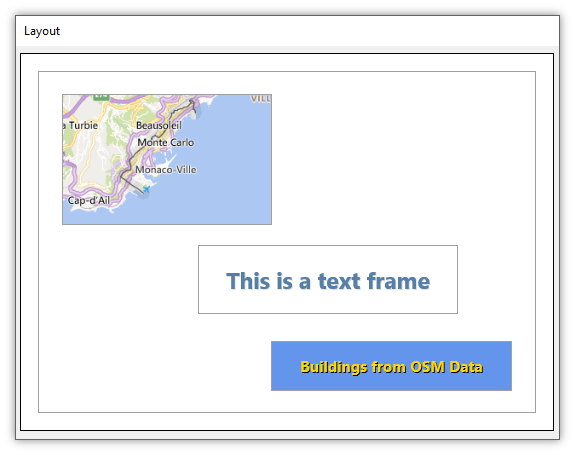 We can resize and reposition the text frame as desired, or click again to create another text frame. When we are finished creating text frames we can click the Default + cursor tool in the main toolbar to exit Create Label mode. 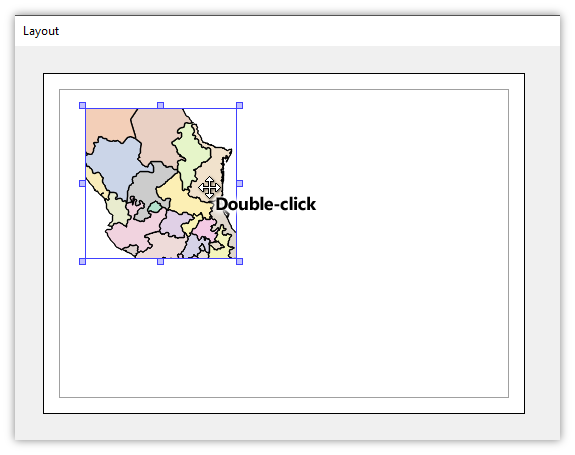 We open the layout and click on the Create Label tool in the main toolbar. In the layout we click approximately where we would like the text frame to appear. A small text frame of default size appears at the clicked spot. It is already enabled for editing, as if we had Alt-clicked an existing frame. The Record panel pops open with the default text and styling for the text frame as seen in the illustration at left below. If we like we can manually change the X and Y extents of the frame by entering whatever extents in millimeters we desire. Except for special, rarely met purposes, doing that is insane as it is far easier to simply drag the borders of the frame to resize it and reposition it as we like. Instead, we will use the Style controls for Color, Fill Color, Label Style, Font and Font Size. We replace the default Text string with the phrase This is a text frame. We change the Font Size to 16 points and then we press the Update Record button to apply the changes. Immediately, the new text appears and the text size increases to the larger font size we specified. Now we will resize and reposition the text frame. To do that, we click on the Default cursor button in the main toolbar, to exit Create Label mode. This allows us to click into the Layout without creating a new text frame with each click. We drag the corner handles to resize the text frame as seen above. We now have room for an even larger font, which will be easier to see given the reduced size of the layout in these illustrations. Back in the Record panel we change the Color to a steel blue, the Fill Color to a very light gray, the Font to Segoe UI Bold and the Font Size to 36 points. We then choose a Label Style that provides a drop shadow effect and press the Update Record button to apply the changes. 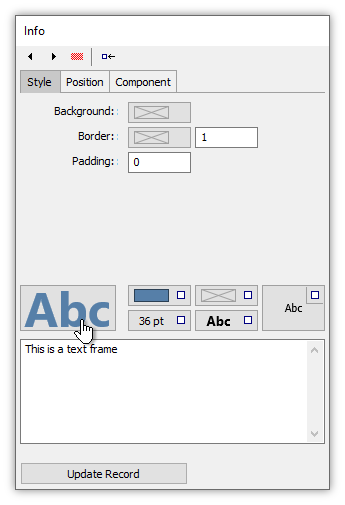 The text in the text frame immediately changes to the new style properties specified. In the illustration above we have Alt-clicked outside the frame to eliminate the editing handles. The very light gray Fill Color together with the drop shadow Label Style provides a slight effect of three dimensionality when seen against a white background. The light gray border around the text frame is just a preview to help us see the extents of the frame. It will not appear in any print to PDF or hard copy. 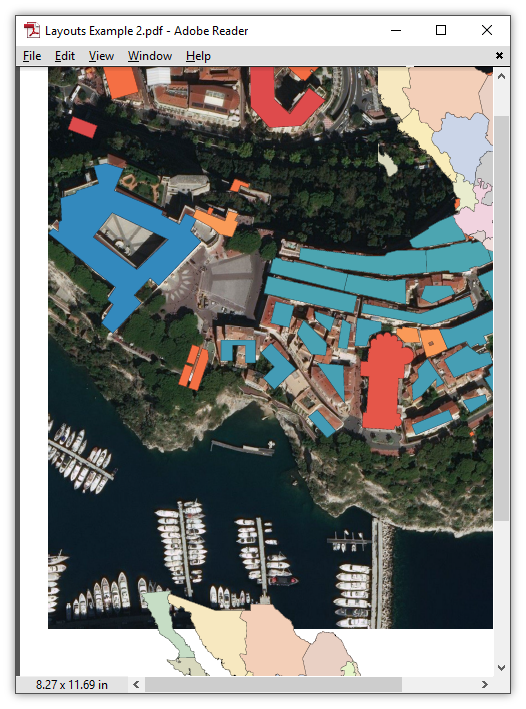 If we use the Layers panel to turn on the background frame in the layout, which shows a map of drawings overlaid on a Bing satellite view, we see it is not so easy to make text visible against a visually busy background. In the illustration above we have changed the text frame to use white Color and black Fill Color, using a Label Style that produces an outline effect. It is still difficult to read the text since the text frame uses default transparent background. All properties of layouts are exposed in tables, which enable us to use SQL and programming to manipulate layouts. For example, changing the Page Setup changes the properties of the layout. We can see the properties of a layout by right-clicking on the layout in the Project pane and choosing Properties, or by choosing View - Properties for an open layout window. Like everything else in Manifold, we can reach the data for layouts in a table, with the properties available in the mfd_meta table as seen above (relevant records selected to emphasize them). In addition to managing layouts with a point and click user interface, we can manage layouts with SQL and programming by manipulating the properties of a layout. 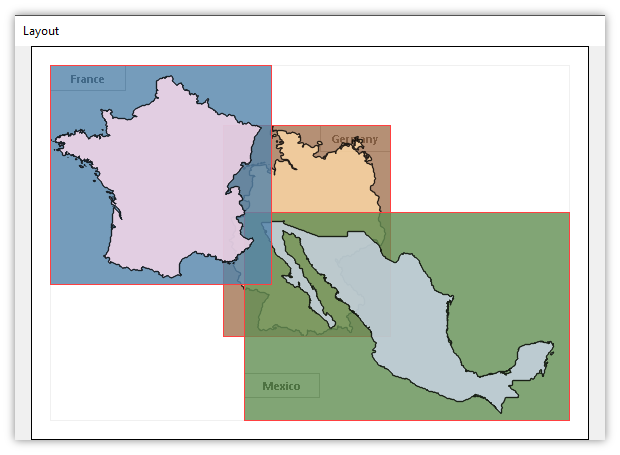 Consider a layout as seen above, where we have added a third frame that shows regions in France. Opening the layout's Properties dialog, we can right-click onto the value of the property for Item.2 and choose Edit, to show the complete contents of that value. That shows us the data for that frame, the source of data, [France] and other information such as the Z order, with 0 being the uppermost frame in the stack of frames in the layout. The value is written in human-readable JSON style. In the Properties dialog we can Ctrl-click the row for Item.2 to select it and then we can press the Delete button. 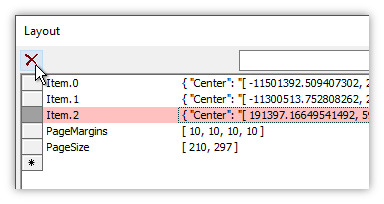 That deletes the item from the properties of the layout and also deletes any references to that property from the mfd_meta table. The corresponding frame in the layout is also deleted. Note: With beta builds and undocked layouts we may have to dock and undock for the layout to refresh, or to choose View - Refresh. Betas are fun! Changing the values for Z for a frame in a layout's properties allows us to specify where in the display stack the frame should appear. Normally we do that interactively using the Layers panel but for programmatic manipulation of layouts we can use the Z property. 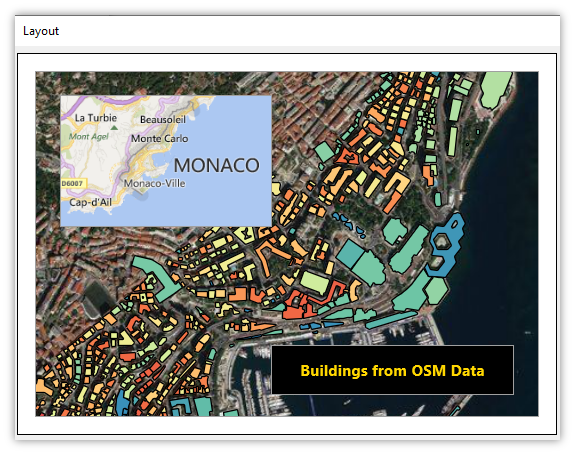 In the illustration above we have added a frame that contains a map with two layers, a drawing layer showing buildings in Monaco and an image layer showing the Bing Satellite image server imagery for Monaco. 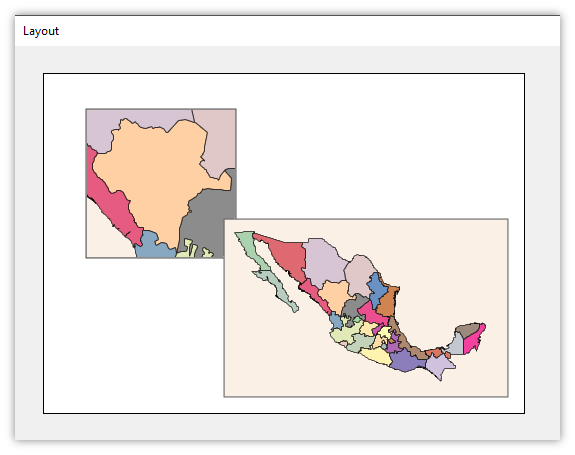 We have edited the Z value in the map frame's properties to be 2 and have changed one of the two Mexico frame Z property values to be 0 while leaving the other at 1. 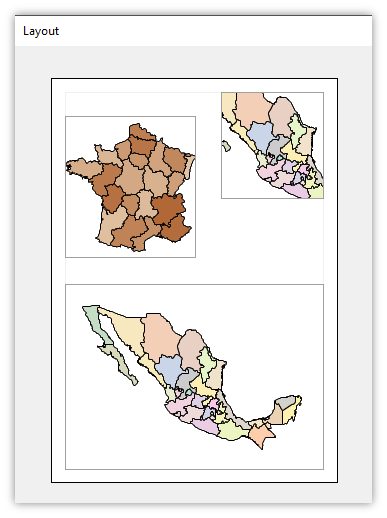 That specifies the map's frame will be drawn lower than the two frames showing Mexico. When printing, images will be rendered to the full resolution available within the image. That can provide some astonishingly high resolution in the case of imageserver images which are brought in on demand. 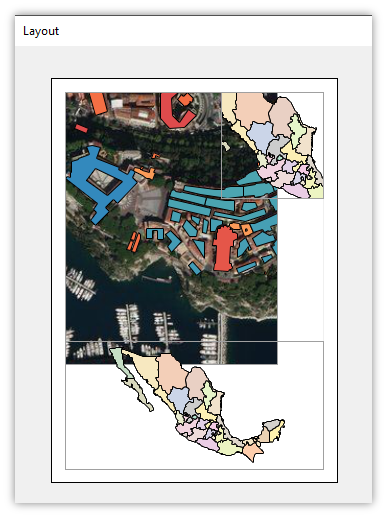 For example, the above shows a PDF created from the layout which includes a map that has a Bing satellite image layer. The PDF supports high resolution so Manifold automatically brings in whatever tiles are required to utilize that high resolution. If we zoom further in there is no apparent pixelation in the image, a result of the high resolution available for such images from the Bing server. 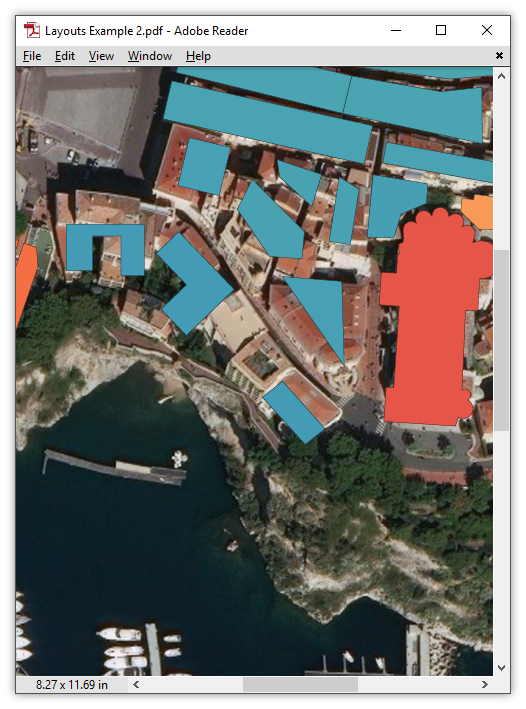 The vector layer showing buildings is also razor sharp. It is likely that Manifold versions in the near future will evolve more automatic zoom behaviors for dealing with maps that contain imageservers as layers, for example, zooming to fit to the largest layer that does not cover the extents of the entire Earth. 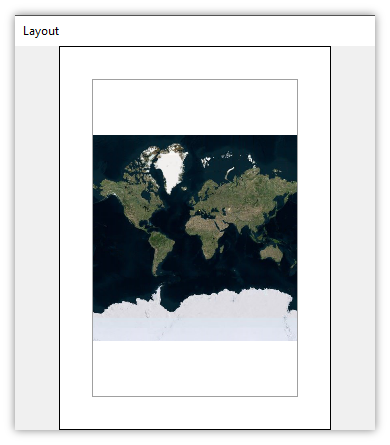 For now, the need to manually zoom into frames that contain whole-Earth imageserver layers is an example of the Note below on WYSIWYG in Process. Not in Viewer - Layouts are not included in Manifold Viewer. Viewer cannot compose layouts or print layouts. Deletions are Confirmed - Deleting frames in a layout displays a confirmation dialog. The default button in the confirmation dialog is set to Cancel. If we do not want to see the confirmation dialog, we can check the Never show this again box. That will remove the confirmation dialog for deleting frames in layouts, for deleting objects in drawing layers, for deleting labels and for deleting records in tables. Another way to eliminate the confirmation dialog is to uncheck the Confirm deleting records box in the Tools - Options dialog. Frames in a layout are records in a system table, hence the "records" terminology. Layouts are Fully Parallel - Layouts are not only dynamic, they are fully parallel. As parallel processes make changes to components those will be updated within any frames in which they appear in any layouts. 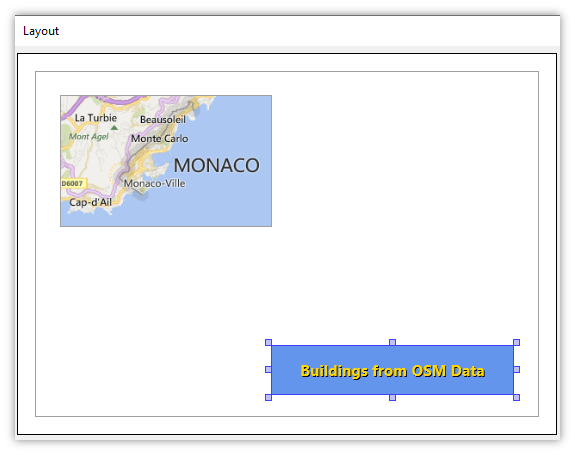 For example, if we create a data source using some remote server that contains large vector drawings but the combination of a remote server and a slow connection requires a few minutes for the data for a really big drawing to make its way to our workstation, when we drag and drop that drawing into a layout we will see how the frame for that drawing becomes populated within the layout as data comes in from the remote server. WYSIWYG in Process - Layouts as currently implemented are only approximately WYSIWYG ("What You See Is What You Get") when View - Zoom to Native has been applied so that the size of the layout on our monitor is approximately that of the sheet of paper which the layout represents. If we zoom further in or out the sizes of symbology will stay the same, unlike a sheet of paper as seen in a PDF display where the symbols will get smaller as we zoom out. Plans are to provide a zoom lock by default for layouts to provide a more WYSIWYG effect to better mimic the fixed zoom of a sheet of paper. Rendering Engines - Tools - Options settings in Manifold control what rendering engine is used for display to the monitor. The same settings influence what rendering engine is used for printing layouts. By default, Manifold will use the Advanced engine, with hardware acceleration if available. The Advanced engine supports both antialiasing and alpha (layer opacity) for layers and frames in layouts. If that is turned off in Tools - Options the Basic, Software engine will be used. The Basic engine also will be used if printer drivers do not support use of the Advanced engine. Antialiasing and layer opacity are not supported by the Basic engine. The lack of layer opacity can be an immediately visible effect when using the Basic engine, but the lack of antialiasing might not be noticeable given the very high resolution (thousands of DPI) of some printers. Manifold recommends use of the Advanced engine for best results.